Bob “Benze” Benzenhoefer’s parents were literally the driving force behind his decision to open a bar. Benze’s Blue Goose Saloon is named after Fred and Norine Benzenhoefer’s 1948 Pontiac Silver Streak, a sleek convertible the couple sacrificed in order to start a family. Old photographs of the smiling pair next to their beloved ride now hang in the new establishment. 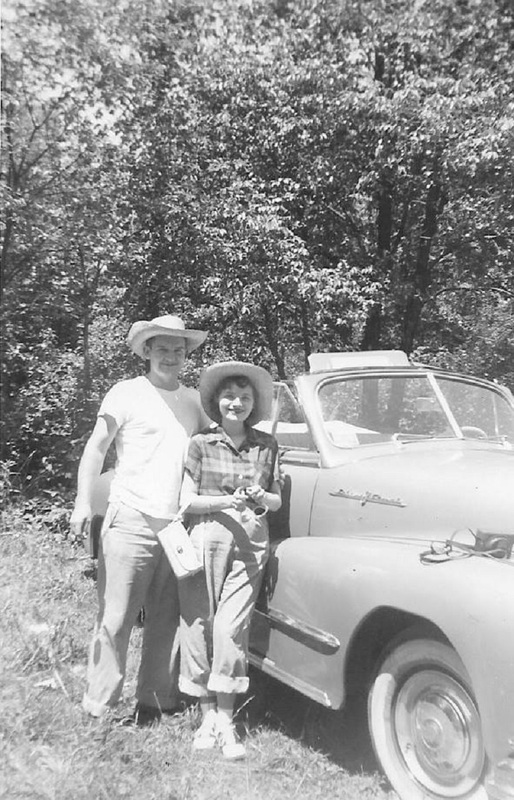 Fred and Norine Benzenhoefer with their beloved Blue Goose. The bar, hovering near Etna’s northern edge on Mt. Royal Boulevard near the Boyd & Blair distillery, has changed names and hands half a dozen times over the years. When the Benzenhoefer siblings took over in February, they knew they wanted to keep the neighborhood bar feel while “goosing” the menu a bit to ditch the microwaved eats. Visitors will find enhanced pub grub, ranging from chicken tenders, steaks, burgers and quesadillas, to an assortment of skin-on French fry baskets. The Goose Bay Fries, for instance, are seasoned with Old Bay, topped with shredded cheddar and mozzarella cheese and served with Maryland-style Ranch dressing. The Benzenhoefers’ personal favorite — and the biggest seller since the joint opened in June — are the jalapeno peppers, which are stuffed with country sausage, wrapped in bacon and pan-fried in a bourbon-caramel sauce. Benze has spent the majority of his life in various kitchens around Pittsburgh and beyond. He started as a teenage bartender back at the VIP Club in Hampton, his hometown, and went on to manage the North Park Lounge and North Park Clubhouse, the Spaghetti Warehouse in the Strip District and TGI Fridays in Pittsburgh International Airport. He also worked at Buxy’s Salty Dog Saloon, a Pittsburgh-themed bar in Ocean City, Md., owned by his college roommate Doug “Buxy” Buxbaum. It’s a place that vacationing Pittsburghers in Ocean City flock to for communing with other black-and-gold fans. The Benzenhoefers hope Benze’s Blue Goose Saloon will offer the same type of Steel City camaraderie. Though they’re not around to see their son managing this new watering hole, Benze’s sister and co-owner of the bar is sure they’d be pleased about it. The post Benze’s Blue Goose Saloon opens in Shaler for Steel City camaraderie appeared first on NEXTpittsburgh.